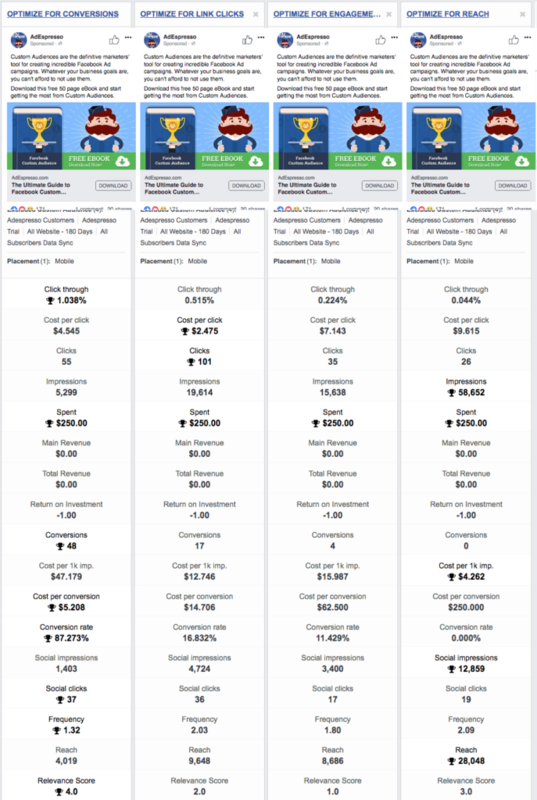 The $1,000 Experiment: Which Facebook Campaign Optimization Type Works Best? 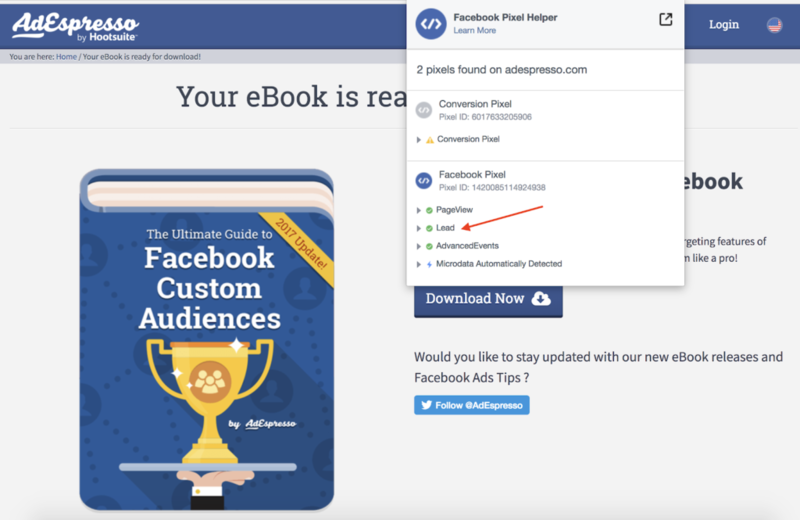 You are here: Home / Blog / The $1,000 Experiment: Which Facebook Campaign Optimization Type Works Best? 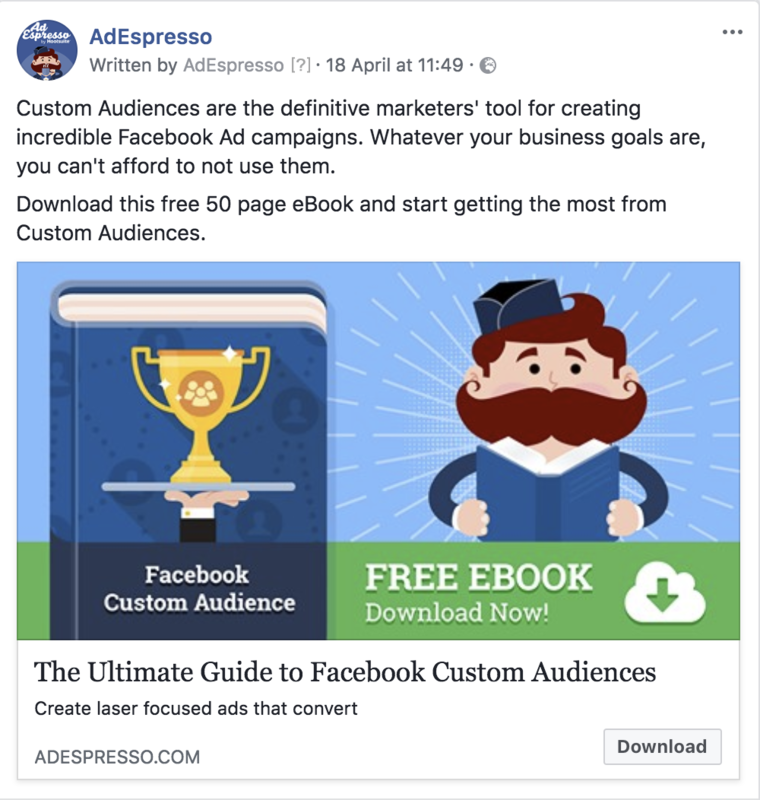 When creating a new ad campaign on Facebook one of the many things to decide on is what optimization to use for your ad delivery. Should you go for Conversions? Landing Page Views? Link clicks? Here at AdEspresso, when we have a question we must get an answer, you know that! What’s the best way to find a “scientific” answer? To put some money and run an experiment. Don’t reach for your wallet yet. It’s our treat! Yes, we put $1,000 of our own ad budget into this experiment (so you don’t have to) to test the different optimization types. The starting question is: does your optimization choice really make a difference to the results? And the answer is… There’s only one way to know, read this article! If you’d like to see us go through the campaign in detail please watch the video below, otherwise carry on reading, you’ll find a full description of the experiment we ran. Which Facebook Campaign Optimization type should you pick? 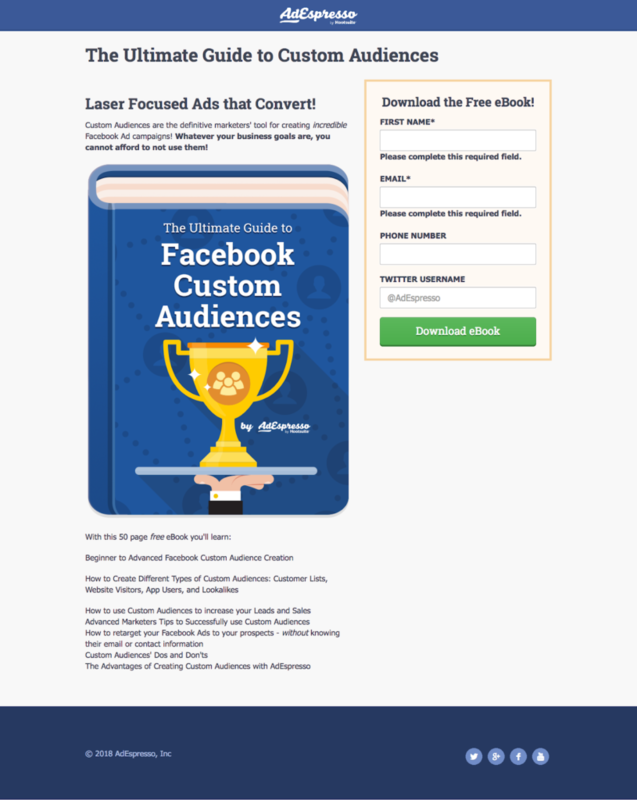 For the test we decided to use an Ebook about Facebook Custom Audiences as a lead magnet, this should give us leads at a reasonable CPA so that we will have enough conversion data to analyze. When the form was filled in this, in turn, took users through to a thank you page where we could fire the Lead pixel event. To be a true experiment three things are important; the campaigns must be given enough budget, they must be given enough time and all variables must be kept to a minimum. From the results summary, we can see that each optimization is working well. This is good news for advertisers as it means the Facebook algorithm is consistently achieving the objectives we set it. One thing that did surprise us was that optimizing for conversions had a higher CTR than optimizing for link clicks. To understand the reason why, we need to look at the CPM. When optimizing for conversions the CPM is very high, meaning the algorithm is focusing on a small but high-quality audience of people that take action. We saw over a 10 times difference in cost per thousand impressions and cost per lead. It’s fair to say that optimization selection has one of the biggest influences on the outcome of any campaign. Some advertisers haven’t used pixel tracking in the hope that driving the maximum amount of traffic using link click optimization would work by sheer volume of numbers. So many campaigns fail because the advertiser doesn’t know what they actually want from the campaign! Do you want leads, website traffic, engagement or maximum reach? Decide on your goal before even creating the ads if you want to achieve success. It’s not possible to get high marks for all metrics in one campaign. For example, if you want a high volume of leads you should expect the reach to be much lower. Focus on your main goal and don’t worry if secondary metrics underperform. What do you think? Did you get the same results with your campaigns? Which kind of answers do you want us to find for you? For the CPC comparisons, why didn’t you use Cost Per Landing Page View? A lot of advertisers report link clicks to be 3-5X higher than GA sessions [understand that they’re both different metrics]. However, I’m noticing that ad agencies are now reporting CPC along with CPLPV [Cost per Landing page view] as the latter uses FB pixel data – to provide a sense of how much traffic to expect. Hi Adil in AdEspresso when we display CPC that’s cost per outbound click. We reported on that figure as that’s one of the optimizations we used so it’s a key figure to include. If we were optimizing for landing page views then we would have included cost per landing page view but as we weren’t we left it out. There’s lots of interesting metrics we could include but for clarity we just included the top six. Hi Paul. But if you would’ve included Cost Per Landing Page View, your experiment would be even more accurate, since Outbound clicks don’t measure the bounce rate of those clicks on the landing page. Besides that, loved the work you did with this experiment, very very helpful. So optimizing for conversions gives the same number of landing page views as optimizing for link clicks but results in more conversions. Great takeaways! Have you run similar tests for desktop placements? We haven’t run it on desktop but on desktop we usually find a higher CPC and a higher conversion rate. Mobile now accounts for 91% of Facebook’s ad revenue, the capacity is just so small on desktop and even for B2B we’re finding good results on mobile just because of the volume of traffic. Mobile also includes ipads and tablets and with phones generally getting larger it’s by far the main placement. Hey, you didn’t mention – what campaign objective were you using? Conversion? Hi Adi, yes we optimized for conversions. Thanks – really nice experiment. Would you still recommend running conversion optimization even if pixel is still fresh and haven’t gathered enough data (50 conversions per week as suggested by FB)? Or should I go for traffic campaign optimizing for link clicks? Looking forward to hearin from you soon. I would like to know this too if possible.